The daiquiri, that simple mix of rum, lime juice and sugar is one of, if not the, classic rum drinks. David A Embury, in his classic title "the Fine Art of Mixing Drinks" classed it as one of his six basic drinks (along with the Jack Rose, Manhattan, Martini, Old-Fashioned and Sidecar). "So far as I can ascertain there are two main reasons why more daiquiris are not sold: The use of inferior rums and the use of improper proportions"
To deal with the first point, the origin story of the Daiquiri has it being made with Bacardi Carta Blanca which is now sold as Bacardi Superior. I'm not a fan of Bacardi by and large but Superior does make a good daiquiri however, my personal favourite daiquiri rum is Plantation 3 star which has been distilled with the daiquiri in mind. Whatever your preference make it a good quality rum, I've tried using supermarket own label rums and it's a false economy. Embury's recipe is a simple one, 1 part sugar syrup, 2 parts lime juice and 8 parts white label Cuban rum, shaken over ice, strained and served in a chilled glass. This recipe is simple, refreshing and has a lovely smoothness to it. The broadly accepted history credits a US engineer Jennings Cox with creating the daiquiri. Following the Spanish-American war of 1898 he was sent by the Spanish-American Iron Company to manage mines in the Sierra Maestra region of Cuba . As you'd expect the conditions were harsh, yellow fever was endemic so the engineers were given good wages and a tobacco ration, however Cox also negotiated a monthly ration of the local white rum, Bacardi Carta Blanca. One of the mines Cox was responsible for was located in the village of Daiquiri, East of Santiago De Cuba. One theory has it that while Cox was entertaining guests he ran out of gin, which was the more socially acceptable drink and, being wary of serving neat rum to his guests added lime, sugar and crushed ice to take the edge off. 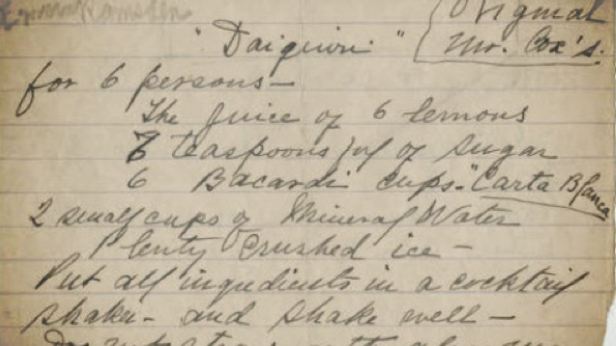 Another version suggests that a Cuban engineer named Pagliuchi was visiting Cox at his mine near the village of Daiquiri and, after a hard day's work made a drink with whatever was to hand, namely rum, lime and sugar served over ice. One thing to note is that Cox says to use lemons, however as limes are abundant on Cuba and are commonly referred to as " 'limón" it's probable he was referring to limes. The recipe as written is similar to that for Grog, the drink used to serve the daily rum ration to sailors of the Royal Navy, so adding lime and sugar to rum is hardly a great leap of logic. The daiquiri stayed as Cuban drink until 1909 when Admiral Lucius W Johnson, a medical officer in the US Navy enjoyed the drink and introduced it to the Army & Navy Club in Washington DC. From here the popularity of the drink grew and spread, aided by rum being much more widely available following FDR's Good Neighbour Policy which increased imports of Latin American goods and seen as more exotic and less as a drink of sailors and low-lives. At the legendary Havana bar El Floridita a Catalan immigrant Constantino Ribalagua Vert developed and improved on the basic daiquiri recipe. Switching from crushed ice to shaved ice and using a blender he's the father of the frozen daiquiri.. During the 1930s and 40s Ernest Hemingway lived in Havana, writing masterpieces such as "For Whom the Bell Tolls" and drinking a prodigous amount of rum. "That's good but I prefer it without sugar and with double rum"
Over time this evolved with the addition of a half shot of sugar syrup to allow for those without a palate made of cast iron. Ribalagua created four variations on the basic daiquri at El Foridita, handily naming them numerically and they're listed below, all should be shaken over ice and strained before serving. So just remember when making yourself a daiquiri, use the best rum you can find, the freshest juices, get your proportions right and you'll soon be sipping on a classic cocktail with a storied history.